Premium grade extruded PTFE-lined braided hose is available in various lengths of -3, -4, and -6 AN configurations. 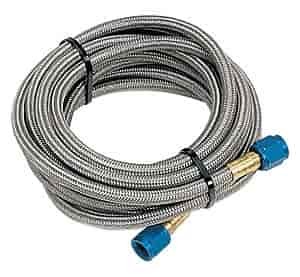 Stainless braid hoses will come complete with black ("stealthy" fuel or nitrous), red (fuel), or blue (nitrous) anodized fittings. 15295 is rated 4.0 out of 5 by 1. Rated 4 out of 5 by Mikels76 from GREAT QUALITY HOSE Just ran the new nitrous line the other day . My Crown Vic P71 being over 16 Ft long had to run a second line ZEX BRAND attached to the NOS BRAND . Both are great quality . Would have given the NOS 5 stars except ZEX hoses are less expensive.